Medicine: What motivates anyone to be a doctor? Why Does Anyone Want to Be a Doctor? 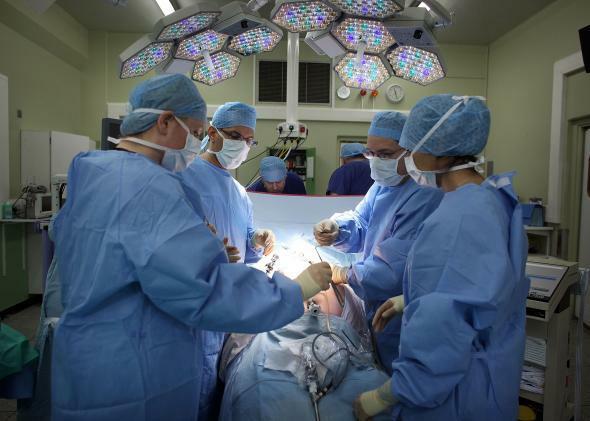 A surgeon and his team perform an operation in 2010 in Birmingham, England. The alternatives to medicine are much easier if your primary goal is to make money. To become a doctor, and especially a specialist who earns in the top quartile of physicians, you’ll need four years undergrad, four years med school, and then five-plus years of residency and fellowship training. That represents around half a million dollars in tuition and living costs on top of associated opportunity cost. You’re also giving up most of your 20s and part of your early 30s in pursuit of miserable 80-plus hour workweeks. Contrast this with an investment banker who can get by with just four years of undergraduate education. Or a software engineer: You can easily make six figures straight out of graduation, and by the time a doctor makes a real salary (approximately seven to 10 years post-undergrad), the investment banker will probably have moved into some upper management role making a similar salary as the doctor (if not more than). So thankfully, people go into medicine not because of the money, but because they love the intellectual and personal challenges that come with the profession. As for the economic side of things, yes, the high compensation is a nice reward after all that work. It’s also a very stable and time-tested profession, but only after you put in the work. So, if people graduate with tons of debt and bad working hours, why go into medicine? This reminds me of a particular case I worked on with a neurosurgeon over the summer. I showed up at the hospital promptly at 6 a.m. and met the residents I was assigned to in the cafeteria. While discussing the case over breakfast, two very nervous-looking parents approached us, and they happened to be the parents of the little girl we were operating on shortly. They looked worried, but we reassured them that everything will be fine. As we walked into the OR, I saw the girl—no older than 10—on the operating table getting prepped by anesthesia. As we were waiting, a nurse showed us a list of questions she made before she was put under. She had a spine condition called tethered cord syndrome, and her list had the most insightful of questions: What’s a filum terminale? (It’s the anatomical structure that was causing the abnormality.) What’s the difference between a neurosurgeon and a psychiatrist? (Their egos.) In it, we had a glimpse into her aspirations and dreams. No other profession lets you look that deeply into someone’s humanity. Nevertheless, the surgery was pretty uneventful. A filum release is a relatively simple procedure, but only in medicine do you see the beauty and intricacy of the human body. As we dissected out the meninges, I saw how delicate the arachnoid was—the amount of care and precision needed was the difference between a successful operation and rendering her a paraplegic. After we did our thing, closed her back up, and saw her back in the recovery room, something hit me that made me realize again, albeit, hitting home harder this time, the precise reason why I went into medicine. As that little girl opened her eyes, as she was weaned off the anesthesia, that look on her parent’s face was priceless. There’s a certain amount of trepidation in sending your kid to have her spine opened up. But when things do go well, the look of joy and relief—an expression of pure and raw human emotion in your patient and their family—that’s precisely the moment we work for. Doctors: Why don’t we train more doctors? Salaries and Wages: What kind of jobs do software engineers who earn $500k per year do? Jobs and Careers: From the perspective of a CEO, what are the most underrated skills most employees lack?